Sodium lauryl ether sulphate, disodium monolauryl ether sulphosuccinate, coconut fatty acid diethanolamide, laurdimonium hydrolysed animal collagen, macrogol 120 methyl glucose dioleate, sodium chloride, concentrated hydrochloric acid, imidurea, sodium hydroxide, erythrosine sodium (E127), purified water. ive read nizoral works for many people with fungal acne/small skin bumps but in my experience it causes nasty redness and irritation (i have sensitive skin). IMO its a treatment for a certain type of acne. this product not for everyone. 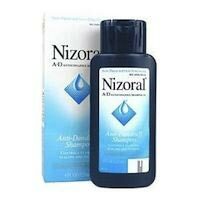 NIZORAL WAS THE ONLY THING THAT CLEARED THE SMALL BUMPS ON MY FOREHEAD. USE TWICE A DAY FOR 3 MINUTES. Nizoral was the first type of seborrheic dermatitis treatment I tried and it has been my faithful go to treatment. It contains an active sebderm fighting ingredient called "ketaconazole" which is powerful against seborrhea. You can use it on your scalp for dandruff flakes or let the suds run down onto your face. Either way it has worked quite well. The only drawback is the fact the dermatitis can become resistant if it's the only shampoo you use. Try to incorporate a rotation of sebderm treatments so that the malassezia furfur doesn't have a chance to develop a resistance to anyone method of treatment! Anti androgen - perfect for hormonal adult acne. I bought this shampoo from my local chemist, was actually 1%, so i could thicken my hair and help it grow fast.. Anyway, 3 years later I have gone off my pill for cholesterol reasons, and have the worst adult acne out. Im currently taking saw palmetto but need instant results. I remember reading that Nizoral is an anti androgen so i gently put this on my face in the shower, left it for 3 minutes, and rinsed off with cool water. My acne feels so much better and has stopped hurting! I just moisturised with aloe mixed with bio oil to stop it from drying out.